The marketplace at Tlatelolco had items for sale from all parts of the empire and beyond. The Spanish marveled at the products offered, the organization of such a vast market and its cleanliness. On its busiest days there were over 50,000 people there, buying and selling. One of the core activities in any empire is trade. The Aztec Empire at the time of the Spanish Conquest had a vast and complicated trade network that had an equally complex infrastructure and bureaucracy to support it. The pochteca, the elite class of long-distance traders, played an essential role in Aztec commerce and Aztec statecraft. Trade networks existed in ancient Mexico long before the Aztecs occupied the central valleys that would later become the core of their empire. Archaeologists have seen long-distance trade in the archaeological record as far back as what is termed as the Early Formative period with the ascendancy of the Olmecs a few thousand years ago. The great city of Teotihuacán, which reached its height in central Mexico at around 400 AD, had trade networks reaching as far away as modern-day Guatemala and the American Southwest. 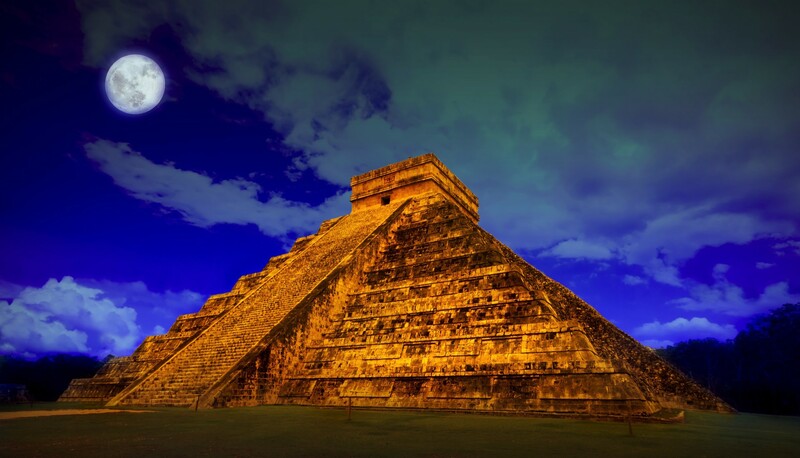 Other Mesoamerican groups engaged in foreign trade, but researchers know the most about the Aztecs because they were a living, breathing civilization at the time of the Spanish contact. Early Spanish chroniclers wrote down the specifics of the everyday lives of the Aztecs in great detail and from these accounts we know a great deal about the long-distance trading class of people called the pochteca. There were many people throughout the Aztec Empire and in ancient Mexico as a whole engaging in petty commerce much as experienced in Mexico today. Every town had its market where common citizens would offer some of their crops, their fish catches or some of their handywares, and shoppers would barter and haggle much as they still do today. The small-time vendors at many of these markets were not considered to be a part of a distinct class, though, and many of them engaged in commerce part-time to get rid of their surplus. The larger cities had bigger and more sophisticated markets, with the ultimate marketplace located at Tlatelolco, as already mentioned. In the larger markets shoppers would delight in finding luxury goods from all parts of the empire and beyond, courtesy of the pochteca, the specific group of traders who held a monopoly on foreign commerce. The members of the pochteca class traded the products of central Mexico across long distance in exchange for the exotic. To faraway lands they would bring cloth, embroidered clothes, rabbit’s-hair blankets, obsidian knives, fine jewelry made of copper or gold, medicinal herbs and cochineal dye. They would bring back to central Mexico rare and expensive items such as sea shells, emeralds, tropical bird feathers, translucent jade, jaguar pelts, tortoiseshell, amber and cacao. The pochteca usually traded finished goods for exotic raw materials. Because of the Aztec tribute system, many raw materials flowed into the Valley of Mexico from subjugated peoples throughout the empire in the form of taxes. According to the Codex Mendoza, for example, the provinces of Quauhtochco and Ahuilizapan were to send 1,600 bales of cotton to the Aztec capital each year. In the capital the cotton was finished into marketable goods. The pochteca then took the finished goods on their long-distance journeys. There were no beasts of burden in ancient Mexico and no use of the wheel, so there were no pack animals and no carts. All merchandise was carried on the backs of porters. Because merchandise was not able to be moved in a massive scale or quickly, as we are used to today, food was rarely traded over the long distances. While almost anyone could sell in the common markets, the pochteca had a monopoly on long-distance trade. They were organized into corporations or guilds and the pochteca had a great deal of autonomy in Aztec society. They lived in their own designated districts in the major cities of the Aztec Empire such as Chalco, Texcoco, Otumba and others, and of course, in the capital city of Tenochtitlán. Before Tlatelolco was absorbed into the capital city, the pochteca had great prominence there and lived in a district of the city called Pochtlan, and hence the name of the class of traders. In the pochteca districts of the major Aztec cities the traders enjoyed privileges unique to them. Each pochteca group was ruled by elders who were experienced but no longer able to travel the long distances. The elders would represent the pochteca before the emperor and would conduct their own ceremonies and would administer their own form of justice among this elite merchant class. In ancient Aztec society the emperor’s courts judged everybody from the priestly class to the members of the nobility to the commoners. Only the pochteca had separate justice outside direct imperial authority. The pochteca married among themselves and the profession could only be passed down from father to son. Male children of the pochteca attended elite schools alongside the children of priests and minor nobles. The pochteca had their own religious observances and prayed to their own gods without the assistance of the Aztec priests. On long journeys they were their own priests and were also their own fighting force. Many pochteca were considered great warriors as they had to fend off attacks from marauders on the road who coveted their wares. They were also exempt from manual labor and personal service. In effect, the pochteca were a nation within a nation. The ruling class permitted this because of the valuable roles they played throughout the empire and beyond. Basically, the pochteca were allowed to continue enjoying their special status just as long as they kept up with their difficult work of brining luxury goods to the elites and as long as they didn’t flaunt their wealth. There were several different types of pochteca in the Aztec Empire. The Pochteca Teucnehnenqueh or “traveling lords,” traded on behalf of the nobility – personal shoppers, so to speak – and were considered the highest rank of pochteca. There was also the Naualoztomeca or the “disguised traders” who would learn the languages and customs of the destination country and funnel back intelligence to Tenochtitlán. The Tealtianime were slave merchants who brought back captives to the Aztec heartland for human sacrifice. The Iyahqueh acted as the support along the trade routes, manning depots and waystations and were important links in the trade networks in faraway places. Had the Spanish Conquest not occurred it would have been interesting to see what would have happened to this wealthy and cultured merchant class. Would they have eventually been co-opted and absorbed into the Aztec nobility? Would their ranks and wealth have grown to overshadow and replace the hereditary system of nobles governing the empire? Their upward trajectory was clear but ultimately cut short. Drennan, Robert D. “Long-Distance Movement of Goods in the Mesoamerican Formative and Classic.” In American Antiquity, vol. 49, no. 1, Jan.1994, pp. 27-43. Soustelle, Jacques. 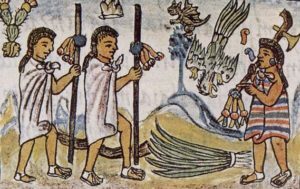 Daily Life of the Aztecs on the Eve of the Spanish Conquest. Stanford: Stanford University Press, 1961.